Authors' Note: This paper is based on a talk given as part of a workshop on Cultural Identities and Representations in the Media. We would like to thank the organizers Stefan Kramer and Natascha Vittinghoff, as well as the conference participants for some valuable responses. Thanks go to Beate Binder, Tatjana Eggeling, and Dermot Lyons for a number of discussions and helpful comment both before and after the talk. Thanks also go to Ulrich Lutz for technical assistance in producing the video clips we used to accompany the talk. We would especially like to thank Irene Wolke for providing some of the necessary creature comforts. Finally, we would like to thank the editors of Whoosh! for valuable comments. This paper examines the television action series Xena: Warrior Princess in the context of expanding use of new media, increasing globalization, and the phenomenon of identity detached from place, concluding that Xena: Warrior Princess is a response to the need for an action hero(ine) capable of responding to the current crisis of cultural identity as described in Appadurai [Note 01] and others. The conventional action hero embodies the good in human nature, and never surprises the audience by making a choice that would contradict the values that that implies [Note 02]. This makes the conventional action hero in essence a 'flat' character. The flat character's inability to adapt, however, is increasingly seen as a liability and uninspiring as a heroic character trait. Success in the world of rising globalization and new media depends on versatility and adaptability, characteristics not typical to action hero as conventionally understood. This new situation calls for a mass media heroic figure that can be admired by the onlooker for the ability to adapt and succeed in a dynamic world. In the pre-Electronic Present [Note 03], the archetypal action hero was a predictable, stock character. The action hero could be seen as a descendant of the heroes of the ancient heroic epic (a source drawn on heavily by Xena: Warrior Princess) and the romance of chivalry of the Middle Ages. An action hero was typically a flat character, a character that only faced one type of situation and could only respond to any situation in the same, predictable way: through (usually violent) action. CURLY: You want to know what the secret of life is? CURLY: One thing. You've got to find your one thing, and be that. MITCH: What's the one thing? Here, the cowboy action hero Curly is explaining the one approach that works for him in all situations ('I am a cowboy. How would a cowboy respond to this situation?'). Mitch is the hapless city dweller who is unable to cope in Curly's environment because of his own complex urban world (which the filmmakers would have us believe is more complicated than Curly's 'simple' rural existence). Mitch must face a wide variety of situations in different ways, and thus has no real mastery of any one 'way.' It is interesting to note that the film City Slickers dates from 1991, just before the rise of the 'new media', while Xena: Warrior Princess began its run in 1995, when that development had already become a widely recognized phenomenon. XENA: Yes-- how do you know what's the right way for you? HANUMAN: My way is the way of obedience and loyalty. I can see it's not your way. You are too proud. XENA: What happens when a person gets caught between two ways? HANUMAN: That is not good. For each person, there can be only one way. Questions of one way vs. many ways and the concept of identity are explicitly thematized in Xena: Warrior Princess, and the exploration of these themes sets the character of Xena apart from the traditional action hero. In the Electronic Present, success requires the ability to respond to vastly divergent demands and the concept of identity is an increasingly blurred one. Until the end of the twentieth century, an essentialist concept of identity [Note 06] was the ideal, and versatility was to some extent viewed with suspicion and mistrust. As recently as the 1960s multilingualism was believed to be linked to brain deficiency and lower IQ. This belief was based on studies like Goddard's [Note 07] who invented the Binet (IQ) test and administered it to freshly arrived Jewish immigrants, concluding that they were mentally deficient, or Smith, [Note 08] who examined Hawaiian children of Japanese descent and concluded that their exposure to multiple languages impaired their ability to speak English properly. Smith did not take into account that the children she examined were actually speaking an undocumented and unfamiliar (to her) Pidgin. These and other studies mirrored the basic belief system of the time, which has since been proven to be baseless by a host of linguistic studies. [Note 09] Today, in the context of international commerce, multilingualism is a quality highly sought-after on the employment market. This is partly because success in the Electronic Present requires the ability to adapt instantly and to be multifaceted. One has only to look at today's job market to see that any chance of gainful employment requires excellence and experience in various areas. In addition to competence in an employable skill, applicants for any position must at a minimum have the computer skills requisite to any position (mastery of the 'new media') as well as organizational skills, and, of course, the ubiquitous 'ability to juggle multiple complex tasks simultaneously'. Clearly, Curly's concept of 'one way' or 'one thing' is outdated. It is the transition from an essentialist to a non-essentialist vision of identity that lies at the root of the crisis of identity in the Electronic Present. To put this change in context, another useful comparison is found in Star Trek, arguably the most monumental action series of all time, and one that predates Xena: Warrior Princess by nearly thirty years. Star Trek is set on a space vessel in a pseudo-militaristic context. As a result, the role of each character is clearly defined by his or her position on the ship. So much so that one of the show's many catchphrases was Dr. McCoy's recurring line, 'I'm a doctor, not a [fill in the blank].' Whenever Dr. McCoy is called upon to do anything not falling directly within his purview as the ship's medical officer, he uses this line to peremptorily point out that, in effect, what he is being asked to do does not fall within his job description. By contrast, the most frequently recurring catchphrase used on Xena: Warrior Princess is: 'I have many skills'. This line or some variation of it occurs in at least nine episodes, almost always uttered by Xena after demonstrating some uncharacteristic and surprising skill, astonishing the other characters (even her constant companion, Gabrielle). Xena is able to draw on a huge body of skills in her background, never refusing a task she is faced with, overcoming obstacles through her multidimensionality. Thus, she is a role model to those in the Electronic Present having to cope with ever-changing job requirements, in contrast to the former (static) 'action hero'. Both the character Xena and the program Xena: Warrior Princess itself are fundamentally multi-dimensional. The on-screen visual elements present a striking, at first glance almost incoherent, mixture of styles. The show's creator and executive producer, Sam Raimi and Rob Tapert respectively, are American veterans of the Hong Kong style of action film. Consequently, the action sequences stand out from the standard American fare, even to the untrained eye. Yet at the same time, the show makes constant reference to mainstream Hollywood filmmaking and American pop culture. Furthermore, the show, set in ancient Greece, is actually filmed in the temperate rainforests of New Zealand with predominantly local and American actors (speaking in completely modern, colloquial American English). Where possible, Polynesian influences found in the New Zealand setting, such as huts, monolithic statues, and fishing equipment, are used in the shots. The multifaceted nature of the show's look parallels the hero's inherent multidimensionality. Similarly, Xena's character allows for a broad spectrum of interpretation. She is, first and last, an exciting action hero, and if interpreted solely on this level, the character succeeds. The action sequences are engaging, and the character can be seen to be following 'the way of the warrior'. The fact that she is female, however, and acting in the traditionally male role of warrior (and vanquishing males at every turn by dishing out varying amounts of abuse) begs for a feminist interpretation of the character. The show provides no shortage of evidence to support that interpretation as well. Thus the construction of Xena's identity is never based on a static set of characteristics but transcends notions of gender, sexuality, and 'one thing'. She uses her 'many skills' to successfully respond to challenging situations and to extract useful information, which she can then use to construct a more coherent world view. This is an interesting point to note within the context of this paper because Xena does manage to project a coherent identity despite her multifaceted nature ('many skills') and the many levels on which her character can be interpreted. Thus, Xena does manage to follow 'one way' without necessarily being committed to doing this in a one-dimensional manner, i.e., she is not confined to 'one thing' in order to hold on to a coherent personality. Xena is thus the archetypal cosmopolitan and ideal hero figure for the crisis of identity in the Electronic Present: she can travel and survive in many different adverse environments by using diverse survival skills, while still projecting a coherent identity. In the Electronic Present, when a shrinking, increasingly globalized and dynamic world demands that we cope with a ceaseless tide of new situations and technologies and thereby uproots us from an essentialist identity tied to locality and culture, Xena is a role model for the construction of identity. Additionally, the increasing rate of disappearance of real world cultures [Note 15] appears to leave room for the formation of imagined cultures. As increasing globalization puts the pressure of a certain degree of conformity on all cultures, questions of the construction of identity arise. As the average Indonesian becomes more Americanized, the average American may begin to question what exactly separates him or her from the average Indonesian. The ensuing cultural vacuum leaves participants in the electronic present searching for means of differentiation in new ways, which are found in the Agency of the Imagination. Where a retreating sense of community in the Electronic Present leaves a void in the lives of the participants in the obsolete nation-state, some seek to fill that void with the imagined community of 'fandom', detached from place. The new media's potential for communication fosters community independent of location. The development of the show has coincided with the rise of the new media. Its multidimensional construction, as outlined above, is ideally suited to generate interest among the members of a community detached from place. It offers impulses for identity construction (e.g., the perceived need to construct a personal and coherent multidimensional identity to meet the demands of the Electronic Present) in a mass media context. Identity construction is explicitly thematized in Xena: Warrior Princess on a number of levels. One of the most overriding and recurring identity issues of the series revolves around the relationship between Xena and her sidekick, Gabrielle. GABRIELLE: They were like me. Real people. Maybe even good people. Walsim, I... I could see him as a farmer at one time. XENA: He was a carpenter. GABRIELLE: I wonder, what would have happened if I had met you before...before... you know. XENA: Gabrielle, I could never see you as being evil. There is a difference between them and you. GABRIELLE: What difference? Xena, I have changed so much since I met you. I wonder how much of that is timing. XENA: Does it really matter? GABRIELLE: Am I really who I am? Or am I what you made me? XENA: [pensive look] We better get going. If I'm going to stay up all night, I want to get an early start. XENA: I've got that answer to your question--are you who you are, or are you who I made you? XENA: You're Gabrielle: bard, Amazon Princess, best friend. Nobody made you who you are-- it was already there. The question is, who would I be without you? GABRIELLE: Hmm... I can answer that. You'd still be heroic Xena. You were on that path when we met. XENA: Are you crazy? Without you to keep me on the straight and narrow? The question is not one of whether essentialist identity exists or not. The question is one of maintaining a coherent identity despite inner conflicts and despite experiences and skills acquired along the way-- following your 'way' with confidence, responding dynamically to a dynamic world while maintaining your identity. Xena: Warrior Princess also explores the theme of identity construction and reconstruction. In the episode FORGIVEN, Xena gives advice to Tara, an unruly teenager striving to be what Xena is: a good character with an evil past, as if that in itself is an identity that can be constructed, with no regard to the epiphany that Xena experienced that shaped her identity. TARA: This doing good thing-- how do you know what's really good and what's not? I mean, those boys from the gang, they think they're good. How do you really know? XENA: It's not always that simple. I usually go with my gut. And when in doubt, I ask her. [gestures to Gabrielle] TARA: No-- She would know? XENA: Not always. But I know that her first instinct is usually an unselfish one, and that's a really good place to start. TARA: Do you think she was born good? I mean, my father always told me that I was bad from day one. XENA: That is not true. You are what you do. You can recreate yourself every second of your life. Here, in short, is the essence of Xena's ability to interact in a dynamic manner with a dynamic world, the reason she represents a role model for the Electronic Present. Xena is able to reinvent herself within the context of her 'way'[Note 18]. The key to understanding why Xena represents a coherent but multidimensional character, instead of simply an unfocused character, lies in understanding 'the way', and is examined in the next section. From its onset, Xena: Warrior Princess has been an extremely successful show, its success far outstripping that of the show that spawned it, Hercules: The Legendary Journeys [Note 19]. This success is largely because the character Xena is able to appeal to a wide range of audiences through her multidimensionality. Unlike the archetypal action hero Hercules, she is able to offer many different segments of the viewing audience what they want to see. In this way, she transcends the notion of identity itself, able to consistently draw on an array of character traits that appeal to a wide audience. First, Xena can hold her own as an action hero. As alluded to above, each episode is full of Hong Kong-style action [Note 22] and the action sequences in and of themselves are sufficient to keep the most ardent action film fan engaged. Furthermore, the viewer looking just a little deeper will see an abundance of allusions to the action genre, both ancient and modern. Xena finds herself involved in many of the most seminal historical events of her time [Note 23] and the astute viewer will recognize both subtle and not-so-subtle references to the canon of ancient heroic epics (from the Iliad to Beowulf) and the modern action genre (Indiana Jones, Buffy the Vampire Slayer, and others). Xena parades around in bronze and leather. She gallops on a stalwart steed and vanquishes evil wherever she finds it, equally adept with her trusty sword as with all manner of improvised weapons such as frying pans and fish. In short, a viewer simply looking for an action series will not be disappointed by Xena: Warrior Princess. With that in mind, it is interesting to note that in contrast to other action heroes (both male and female), a large part of Xena's adventures consist of facing the more mundane obstacles that the audience is much more familiar with, such as being sick, domestic squabbles, bodily functions, and the proverbial 'bad hair day'. As one example, in the episode IN SICKNESS AND IN HELL, Xena is plagued by an epic case of head lice and Gabrielle is afflicted by a painful skin irritation. Both have to deal with intestinal distress brought on by the cooking of their erstwhile companion Joxer, all while countering the plans of the episode's nominal villain, an evil warlord. Xena frequently faces the everyday obstacles that plague us all with the same aplomb as she does the fantastic foes more befitting an action series, making her even more of a role model for the Electronic Present. As in Ulysses, Joyce brought the heroic epic into everyday life; Xena: Warrior Princess makes surmounting everyday obstacles a heroic act. To further illustrate, Xena spends much of Season 5 pregnant (making her what may be the world's first and only pregnant action hero), bringing this eminently natural but awkward state into the realm of the heroic. However, it cannot be forgotten that Xena is a woman, and an attractive one at that. This simple fact allows for a wide range of interpretations of Xena: Warrior Princess, as will be explored below. Firstly, she is more than attractive enough to draw the young and middle-aged male audience. She is a stunning, imposing figure of woman, towering above most other characters (the actress, Lucy Lawless, stands nearly six feet tall), with dark hair, piercing blue eyes, and showing a great deal of skin. What passes for her armor is little more than brass wire accentuating her voluptuous features, worn over a leather miniskirt and tube top, prominently displaying legs, arms and cleavage. In a word, for the heterosexual male viewer, what is not to like? Yet, those looking for a fantasy 'dream girl' are quickly disappointed. Any advances by male characters are met with Xena's aloof scorn (at best) or a merciless and unbeatable barrage of Xena's lethal combat skills (at worst). She is so uninterested in men that her sexuality is a matter of fierce speculation, as will be further addressed below. In short, there is nothing on offer to titillate the heterosexual male viewer apart from Xena's physical attributes and penetrating stares. Yet, that seems to be sufficient [Note 25]. Xena is an obvious feminist role model because she is one of the very few leading female action heroes. She never relies on a man to get her out of a situation she cannot handle, and this alone sets her apart from all other female action heroes before her. She is physically unmatched and dispatches all adversaries, both male and female, in close physical combat. However, at the same time she is far from the stereotypical feminist icon for several reasons. Again, those seeking a 'monolithic message' of feminism are frustrated. As noted above, Xena: Warrior Princess is also able to transcend expectations of the hero's sexuality by deliberately toying with the issue. At a very early stage in the series, Xena and Gabrielle's sexuality was gradually called into question, and since then there has never been any shortage of innuendo to support the lesbian reading of the show. Lesbian innuendo is known to the fans of the show as 'subtext', and, as alluded to above, is the single most studied aspect of Xena: Warrior Princess [Note 29]. The friendship between Gabrielle and Xena is the centerpiece of each episode, and sometimes there are indications that that friendship extends to sexual intimacy. Apart from the occasional longing glance, double entendre, thinly veiled symbolism, and the like, there are coyly ambiguous kisses and alluring physical contact, to name a few examples. The show's producers have stated that they do intend to 'blur the lines' of the characters' sexuality and that 'the underlying homosexual subtext of the show is not unintentional' [Note 30]. Indeed, when seeing episodes such as A DAY IN THE LIFE (for the picture of the ins and outs of a long-term relationship) or DESTINY (for what is known among fans as 'THE kiss' between Xena and Gabrielle), to name just a few, it is hard to reach any other conclusion than that Xena and Gabrielle are a lesbian couple. Yet those seeking security in a heterosexual hero also find ample evidence: Xena has an ex-boyfriend, Marcus (MORTAL BELOVED) and a son (ORPHAN OF WAR); Gabrielle has an old flame, Perdicas, whom she marries (THE RETURN OF CALLISTO). Despite the appearances of these characters, however, seekers of the lesbian reading are offered some solace in the fact that, with uncanny consistency, any character consummating a heterosexual relationship with one of the female leads (as well as Xena's son Solan, the product of such a union), dies promptly [Note 31]. Ultimately, the show never offers any definitive answer to the question of 'are they or aren't they?' and here, too, the viewer is free to take away the desired interpretation. As mentioned above, the characters on Xena: Warrior Princess challenge our perceptions of how characters on a pseudo-historical drama should behave by speaking in modern, idiomatic American English. While Xena: Warrior Princess makes no pretences whatsoever at historical accuracy, it is nonetheless worth noting that Xena further challenges our notions of the classical world by transcending the boundaries of the world known to the ancient Greeks. It has been speculated [Note 32] that Alexander the Great served as a historical model for Xena, among other reasons because, at least in the early part of the series, her travels parallel the journeys of Alexander the Great: she is seen traveling to the same places as Alexander in the same order. Later in the series, Xena ranges far outside of Alexander's empire and she is seen to visit far-flung locations that Alexander never reached: Britain, Scandinavia, Siberia, China, and ultimately Japan. Yet, wherever she travels, among strange cultures, customs and peoples, Xena never seems out of place. On the contrary, she always knows how to handle herself and to give a few well-placed instructions to Gabrielle. Here, too, she serves as a role model for those trying to cope with a shrinking world. In the Electronic Present, one must adapt to new situations at a moment's notice and, for the successful, there is little or no 'break-in' period. In a discussion of colonialist space and the process by which it was appropriated, Raman [Note 33] notes that in the quest to demystify the unknown and thereby make it less terrifying, the discovery and demystification of these territories is attributed to Alexander the Great--where one has gone before, others can surely follow. Xena can be seen in exactly this same context: increasing globalization brings with it a necessary demystification of alien cultures. Xena's ability to handle herself with aplomb in all kinds of situations and all kinds of cultures is a consequence of her heroic status within the tradition of the Herculean legends. Nevertheless, as with Alexander, she provides a role model for the non-heroic population of the Electronic Present: where one has gone before, others can surely follow. Xena projecting herself onto the world she wishes to conquer. Just as Tamburlaine (and others) 'mapped' their world through conquest, Xena can be seen to be mapping a strange and terrifying world by conquest and travel. The image described above from THE DEBT shows a clear spatial parallel to the image of Tamburlaine feasting his eyes on a known world. [Note 37] If Xena once 'maps' a place she can then move freely there and apply her warrior way, adjusting to local conditions but remaining consistent in her approach. In the episodes immediately preceding THE WAY, Xena is tormented by the question of whether she has followed, and is following, the right path in her life. In THE WAY, she learns from Hanuman that for each person there is only one 'way', but once found, that way can be successfully applied in any situation. 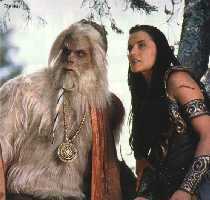 By the episode ENDGAME, Xena realizes that her way is the way of the warrior, which she has applied in her life and must continue to do to be successful (by contrast, Gabrielle must follow the way of peace, and we see the characters apply their two seemingly opposed 'ways' to the same situations). As has been outlined above, Xena's 'way' transcends the viewer's notions of heroism, gender, sexuality, and locality. What makes Xena successful is her ability to transcend any essentialist notion of identity (as a hero, a feminist, a lesbian, etc. ), supplanting it with the non-essentialist capacity for following a 'way'. This makes Xena a role model ideally suited for the Electronic Present, in which 'one thing' (the essentialist notion of identity) is no longer sufficient for success. Appadurai has demonstrated [Note 38] that the crisis of identity in the Electronic Present is distinguished from previous sociological theories of modernity because it is linked to an unprecedented level of globalization and electronic-mediated communication. This crisis of identity, in turn, provokes a new sense of agency, which Appadurai calls the 'agency of the imagination': the new and critical interface between the individual (the focal point of agency) and a globalized construction of identity. This paper has argued that the emerging agency of the imagination requires a new heroic figure, and Xena is perhaps the first manifestation of that ideal. Xena's ability to transcend an essentialist construction of identity is reflected in the show in several ways, not least of which the heterogeneous fabric of the show's structure, but more pertinently, in the character's own non-essentialist construction of identity. Xena transcends the heroic by making the mundane adventurous. She transcends gender by virtue of her role as a masculine action hero. She transcends sexuality through her ambiguous orientation, allowing the viewer to decide. For these reasons, Xena can be seen as a new type of action hero, one created in response to changing notions of identity construction dictated by the transition to the Electronic Present. Since the appearance of Xena: Warrior Princess, more recent action heroes have emerged who seem to be cast in the same non-essentialist mold. [Note 42] It can be speculated that the conventional, essentialist action hero may already be a thing of the past.